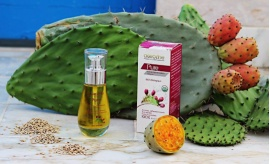 The oil is obtained by first cold pressing of the seeds contained in the cactus fruit (Opuntia ficus indica). This oil is processed manually and mechanically (no heat is used) and filtered naturally without any processing or refining operation. By following this process, we try to preserve the nutrients and benefits of the oil. It is precious, rare and 100% pure serum incredibly effective. It lessens wrinkles, smooths the eye contour, restructuring, nourishing, strengthens the hydrolipidic film and gives tone to the skin. It has a deep lift effect thanks to omega 3, 6, 7 and 9. The prickly pear seeds oil is rich in essential fatty acids including more than 68% of linoleic acid and vitamin E. It stimulates ceramide . This oil is an exceptional ally in the fight against skin aging. - Powerful antioxidant that slows the cells aging: stimulates them to be renovated and protects against free radicals . - Anti-wrinkle: reduces the number and depth of wrinkles and it's a remedy for puffy eyes . - Reduces redness and soothes sunburn . - Restructuring, healing, restorative, it has a positive effect on scars. - Firming and provides a smoothing effect, excellent tensor. - Tightens the skin pores and give skin, face and chest tone and firmness. - Moisturizing, nourishing, its emollient action will soothes and softens skin deep. Apply to the face morning and evening cane be used for all type of skin . 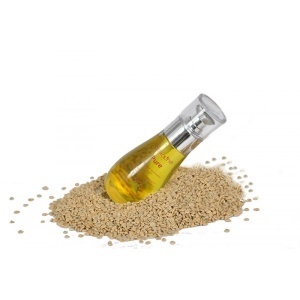 Rich in essential fatty acids including more than 68% of linoleic acid and vitamin E, omégas 3, 6, 7 et 9 .